Josie Guevara Torres is an 8th grader at Capitol City Public Charter School. Her play, Trouble Quinceañera, was featured in November 2006’s New Writers Now! "I was nervous at first but then when I saw the play it actually made me feel better," Josie said. Trouble Quinceañera is the story of a latina girl, Cindy, on the eve of her 15th birthday. Cindy hopes to have a big, traditional celebration for her "quince" but has to face the sad reality of her father’s unemployment. In the end, her friend Alejandro finds a way to make Cindy’s 15th birthday truly special. Like Cindy, Josie hopes to have a Quinceañera, but says "You never know what can happen." Playwriting is very important to Josie. She says "I feel sad sometimes because there is so much pressure for me. I have to baby-sit my brother and clean the house. Writing a play helped me to calm down a little bit." Josie is applying to Duke Ellington School of the Performing Arts in hopes of continuing her craft. She advises other young playwrights "Just do what you feel like to do. Some days you feel sad or emotional. That’s how your play comes out." Josie is already having an influence on her peers. Her friend Sheba saw the reading of Trouble Quinceañera and has decided that even though she’s not Latina - she wants to have a Quinceañera too. UPDATE!! March 2007 - Good news travels fast. 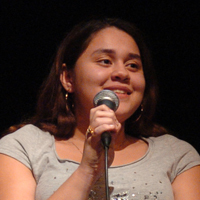 When Priscilla Lindsay and Pat Sanchez of the Indianapolis Repertory Company read about Josie Guevara Torres in the December 2006 issue of the YPT Wire, they thought she’d be a great participant in the 2007 Bonderman Playwriting for Youth National Competition and Symposium. They issued her an invitation and paid the way for Josie and her mother to attend. Josie’s father was so excited he bought his own ticket so that he could be there too. Congratulations Josie! And thanks to the Indianapolis Repertory Company and the Bonderman Symposium for this extraordinary opportunity!